Observed near Page Springs, Yavapai Co., Arizona, USA. August 2011. 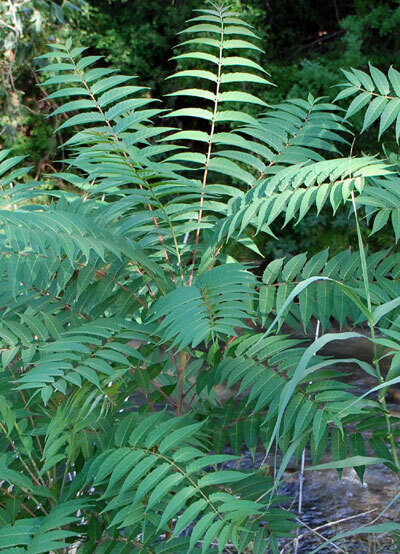 LEAVES: Long (often > ½ m) compound leaves with serrated margins. FLOWERS: Large groups of small yellow-green flowers. TREE: A medium sized tree in Arizona's riparian habitats. RANGE: Here and there in Arizona having escaped cultivation into stretches with moist soil conditions. It is considered usually to be a very unwelcome exotic and invasive weed. A welcome tree in some cities and widely spread throughout North America having originated from China. FRUIT: The single seeds are surrounded by a wide and elongate wing of tissue that allows seed to sail far in the wind. Copyright Michael J. Plagens, page created 17 June 2012.